With compact undercounter refrigeration from Beverage-Air it's easy to maximum your back-of-the-house storage space. The UCR and UCF series boast a wide range of configurations including both refrigerators and freezers available from 20" up to 72". Each unit is below 35" in height too, allowing it to alight with or slide beneath a counter. Plus, both standard and shallow depth units are available to best fit your needs. For reliable performance, each unit is tested to perform in ambient temperatures of 100 degrees Fahrenheit. For durability, each undercounter is built with stainless steel sides, top, and front and features a strong anodized aluminum interior. Adjustable epoxy coated steel shelves are included as well as self closing doors that have snap in magnetic gaskets and a 120 degree stay open feature. These doors are field reversible and also feature cartridge style hinges making them strong enough to withstand downward weight and pressure while preventing the doors from losing their alignment. If you're looking for a storage solution with maximum versatility take advantage of the double stacking option available for select units. This low cost options allows two units to operate while stacked so you can get an ultra space saving solution. Or you can take advantage of additional options with these units such as glass doors, or combination door and drawer models. 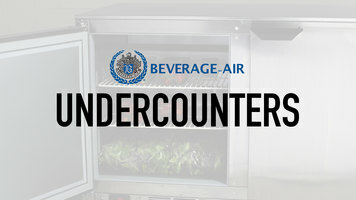 Plus, Beverage-Air boasts the smallest undercounter units in the industry. The UCR20HC and the UCF20HC are each only 20" high. Undercounter refrigerators and freezers from Beverage-Air deliver outstanding value, optimize storage space, and boost efficiency. And like most Beverage-Air units these undercounter units are proudly made in the USA. No matter what your back-of-the-house area looks like, you are sure to find the perfect Beverage-Air undercounter unit to fit your space. Designed with your convenience in mind, these units are meant to last in your busy environment. How do I know if this unit will fit under or match the height of my ADA-Height counter? Counter Height: Work surface is more than 34" high; standard height unit. ADA Height: Work surface height is 34" or less; complies with ADA regulations. Low Profile: Work surface height is less than 32"; designed to fit under most ADA-height counters. If the unit you are purchasing does not have a flat top, such as a worktop or sandwich/salad prep table, it may affect whether or not it will align with certain countertops. To ensure that the product will meet your needs, please reference the product's literature and specifications. I haven’t heard of R290, R600a,or R513a refrigerant before. What is it? R290 (also known as high purity propane or CARE 40) and R600a (also known as refrigerant grade Isobutane or CARE 10) are hydrocarbon refrigerants. R513a (also known as Opteon XP10) is an HFO (hydrofluoroolefin) refrigerant. They are being used as an eco-friendly refrigerant by some manufacturers in response to the EPA’s Significant New Alternatives Policy (SNAP) Program. Read more about this program in our blog post on Refrigerant Regulations. Does free shipping apply to this Delfield item if I am shipping it to a residential address? No. The manufacturer charges a $96 fee for truck deliveries to a residential address. Please contact our Customer Solutions team prior to placing your order if you have any questions. 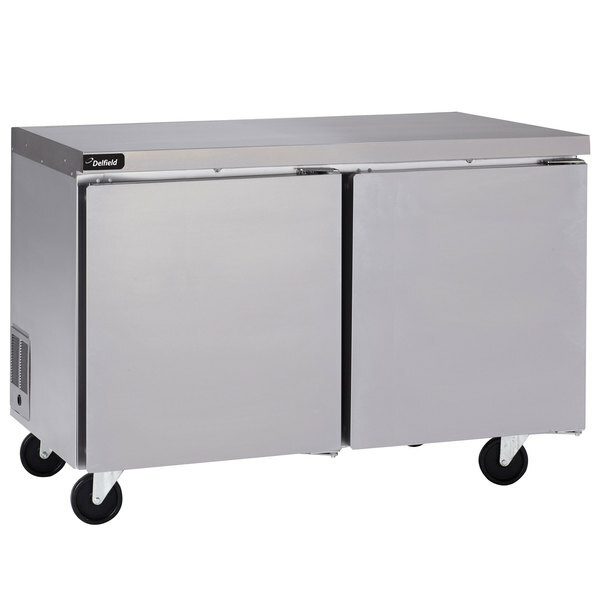 Expand your freezer options with this Delfield GUF60P-S 60" undercounter freezer! This unit is a great way to provide out of the way, frozen food storage when space is a limiting factor. Its durable stainless steel top and front are great for commercial use and easy to maintain. Additionally, the aluminum interior is sturdy and provides you long-lasting use. Inside, the unit has 4 epoxy coated shelves that offer you optimal storage space. Plus, the self-closing door also has a 90 degree stay open feature, for easier product loading. An electronic control system also makes monitoring this model's internal temperature a breeze. Equipped with a 1/3 hp compressor and running on R-290 refrigerant with an Ozone Depletion Potential of 0 and Global Warming Potential of 3, this freezer keeps your items frozen between -5 to 0 degrees Fahrenheit. The high density foamed-in-place polyurethane insulation and door gasket design also conserve energy for increased efficiency. The model comes with 5" casters (2 front locking) so that you can easily move it for cleaning. The unit requires an 115V electrical connection for operation. This item has been tested and meets safety standards imposed by the Underwriters Laboratories (UL) for use in Canada.